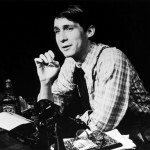 One of many Broadway performers who cut their teeth as replacements in Cats and Les Misérables in the early 1980s, Gregg Edelman first gained notice as Clifford Bradshaw in the 1987 revival of Cabaret. But it was in his role as Stine in the hit musical City of Angels (1989: Book by Larry Gelbart; Music by Cy Coleman; Lyrics by David Zippel) that he came into his own as one of the most highly regarded romantic Broadway leads of his generation. After serving as a replacement in Falsettos in 1992, Edelman was nominated for a Tony® (Best Featured Actor in a Musical) for his role as Constantine Levin in the musical adaptation of Tolstoy’s Anna Karenina by Peter Kellogg and Daniel Levine. In 1994, Gregg Edelman originated the role of Colonel Ricci in Stephen Sondheim’s award-winning musical Passion. Edelman earned a Tony® nomination for his portrayal of Edward Rutledge in the 1998 revival of 1776, and garnered another for his dual role in the 2002 revival of Sondheim’s Into the Woods, in which he played both the Wolf and Cinderella’s prince. He played Robert Baker in the revival of Bernstein, Comden, and Green’s Wonderful Town in 2003. In 2005, Gregg Edelman played Dr. Alexandre Manette in Jill Santoriello’s musical adaptation of Charles Dickens’ A Tale of Two Cities.